Philadelphia formally opened its arms to the world as Archbishop Charles Chaput told the Catholic bishops of the United States that registration has begun for the World Meeting of Families next year in the city. The archbishop made the announcement during the annual fall meeting of the U.S. Conference of Catholic Bishops in Baltimore. With up to 15,000 attendees expected for the gathering of families from around the country and the world Sept. 22-25, 2015, organizers are planning hotel and other accommodations plus a full slate of top speakers and activities for what will be the largest convention for Philadelphia next year. Addressing those matters in six keynote speeches and 67 breakout sessions – each allowing for 15-20 minutes of questions and answers with 700 to 1,000 people per session – will be speakers including Boston Cardinal Sean O’Malley, Philippine Cardinal Luis Tagle and other bishops, priests and religious sisters, plus Helen Alvare, Knights of Columbus leader Carl Anderson, Scott Hahn and dozens of other people with competence speaking about issues facing today’s families. 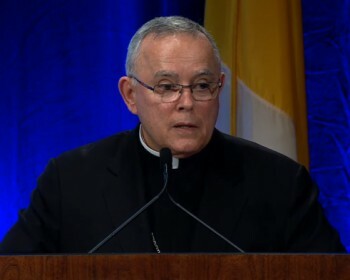 Archbishop Chaput said the content of the meeting will deal not only with issues such as sexuality, which “seem to dominate the American media,” but also on poverty, addiction, children with disabilities, the loss of a spouse, divorce and co-parenting, health and wellness and how these issues affect the family. Other themes such as “creating real intimacy between husband and wife,” the roles of grandparents and the parish community to help deal with the challenges of raising children would also be examined, the archbishop said. Multiple price points for registration at the World Meeting of Families website are offered in two tracks, one for adults and one for young people ages 6 to 17. Four tiers of pricing are open for the Adult Congress and the Youth Congress, including the full package plus a modified and basic package, and one-day registration. The price for one adult in the full package $325 until April 30, 2015. It includes the Adult Congress registration, welcome kit, two lunch tickets, a $100 debit card for expenses, and a SEPTA mass-transit pass valid from Sept. 21 to Sept. 28, a $53 value. The modified package costs $250 and excludes the lunch tickets. The basic package includes only the registration and welcome kit, for $125. The one-day price of $95, available only on site beginning Sept. 16, includes only registration for the day and the welcome kit. Prices for all the packages increase between $25 and $50 as the event nears. For example, the price of the full package for adults rises from $325 now to $350 between May 1 and Sept. 15, and $400 on site after Sept. 16. Pricing for children in the Youth Congress remains consistent from now until the Congress begins. The full package per child is $199 (including registration, two lunch tickets, SEPTA pass and welcome kit), the modified package is $125 (excludes lunch tickets), the basic package is $95 (excludes lunch tickets and transit pass) and the one-day registration is $25. Additional lunch tickets and SEPTA passes may be purchased at the website. Registration for the meeting actually has been open quietly for two weeks in order to get feedback with which to strengthen the process. “It’s so complex, and we wanted to make sure all the moving parts worked well together” before announcing the registration publicly, said Donna Farrell, executive director of the WMF. In October she led presentations in each of the 12 parish deaneries in the Archdiocese of Philadelphia to offer the latest information on the meeting for parish leaders. Feedback from parish pastors, staff and parishioners resulted in changes to the registration process made public today. That included allowing registrants from the local area to opt out of lunch tickets since they could bring a meal from home and decline the SEPTA pass since they would be commute locally. That had the result of lowering the prices for registration, a key goal of the World Meeting of Families, Farrell said. “Archbishop Chaput wanted to make sure this congress was accessible as possible,” she said. Her team of a dozen staffers and volunteers worked to meet three goals for registration: coordinate hotels to offer the best array of options during the attendees’ week-long stay; to work with clergy and religious coming for the meeting, especially those assisting with sacraments; and crafting packages for international and domestic visitors. Already, 32 hotels in Philadelphia have reserved rooms ranging from $299 per night to $129 per night, with an average cost of $220. Farrell’s team now is working with hotels further upstate in Pennsylvania and in New Jersey and Delaware to expand the number of rooms available to attendees. She also encouraged local households to open their homes, if living space is available due for instance to the absence of children living away at college, by visiting the website of Homestay.com. The Dublin, Ireland-based firm matches homes and their particular available situations with travelers coming to the world meeting, and only for its duration. Homeowers don’t need to leave their home during the meeting, as in some other similar housing arrangements. The goal is to “share the cultural experience” of the host family with the visiting family. Parishes in the archdiocese have also been asked to inform Farrell’s office of available living space in parish rectories and convents for use by visiting clergy and religious. One of her biggest challenges with registration has been coordinating the five-day meeting with the widely expected visit of Pope Francis to Philadelphia. Hotel reservation for the World Meeting of Families ends Friday, Sept. 25, even though plans call for the pope to visit Friday evening and Saturday, with about 1 million people expected to attend a public Mass celebrated by Pope Francis on Sunday afternoon, Sept. 27. But since the Holy See has not officially announced the papal visit, rooms are not being reserved for it at this time. “It is our hope and expectation that people registering for the congress would get the right of first refusal” for a room during the papal visit,” Farrell said. But that portion of the registration remains unknown at this time and until Pope Francis’ visit is confirmed, which could be between four and eight months before September.